Have you guys heard about this? It's the COOLEST storytime ever. Which is saying a lot, because I have some pretty cool storytimes (I'm so humble). But this storytime? It's from astronauts. In the Space Station. Yeah. They have already sent one collection of picture books and had a set of storytimes filmed. Totally awesome, you could show them in a classroom or a space-themed storytime or just watch it in your underwear before bed. So are they going to do more? Well guess what tomorrow is?? Launch day for a second set of picture books! More info can be found on their home page. Seven books will be included, but I want to highlight my favorite and share some coordinating activities. Rosie may seem quiet during the day, but at night she's a brilliant inventor of gizmos and gadgets who dreams of becoming a great engineer. 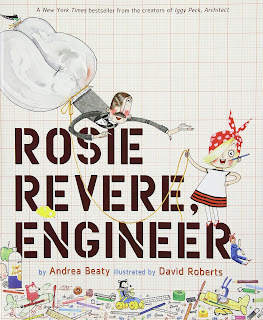 But when Rosie sets to work building a contraption to make her aunt's dream of flying come true, it crashes and so does Rosie's dream. Aunt Rose, however, insists that Rosie's contraption was a raging success. You can only truly fail, she explains, if you quit. It's a brilliant book that made me want to start building something. The STEM theme is obvious (and part of the reason it was picked for the ISS). Roberts did an excellent job on the illustrations, especially with the graph-paper motif. Beaty wrote the story in an especially well-done rhyming scheme, making it really fun for a readaloud. Such a fan of this book. 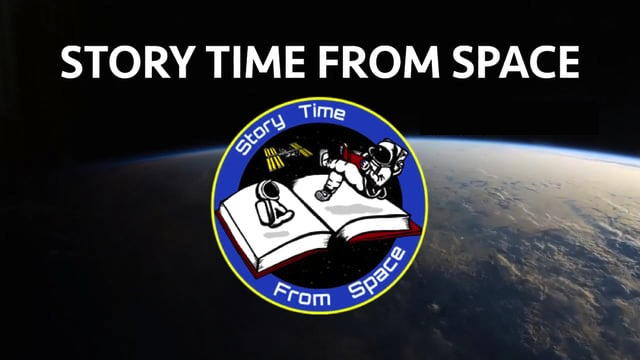 If you want more ideas for a space-themed activity, try out my space storytimes or after school activities. So many fun ideas!